Many recipes in the 18th century use biscuits as an ingredient in other foods. Now I’m a biscuit fan. I’ll take mine hot with a dab of butter and a little honey. It just so happens that my bucket list includes the goal of producing lightest, flakiest biscuit I’ve ever eaten…and it’s likely that the more I attempt to accomplish this so I can check it off my list, the more urgent the matter becomes. But that’s truly beside the point. The old English recipes aren’t referring to the Ol’ Southern variety that utilize chemical leavening agents, i.e., baking powder and baking soda, in order to reach new heights. 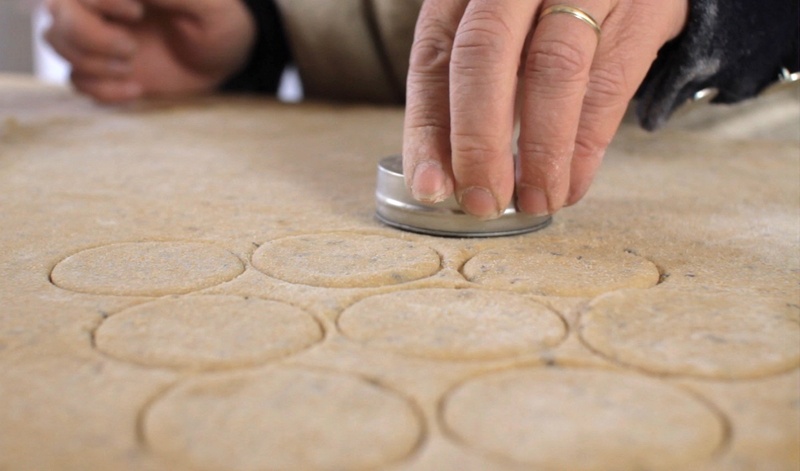 18th century biscuits were most often flat and crisp — more like a cookie or cracker. There were different kinds of biscuits, each with their own texture and method for making. Some recipes called for the dough to be violently beaten with a rolling pin or paddle. This softened the dough and made the finished product lighter. Other recipes required whipping eggs for a long time and then gently folding in the flour. This was actually a early form of leavening. It resulted in a light and spongy texture. Most biscuits, like the simple biscuit, were sweetened with sugar, some, like the ship’s biscuit, were not. While biscuit recipes differed in ingredients and techniques, the one element that seemed to be common across the board was that they were either twice-baked or baked for a longer period of time at lower temperatures. This ensured their crispiness and also allowed them to be stored for long periods of time. The word “biscuit” is believed to come from the Old French that means twice-baked. The biscuit I’m focusing on today is the ship’s biscuit — the plainest of them all. The ship’s biscuit usually consisted of just flour and water. They were favored by quartermasters and ship’s captains for their ability to last. They were baked at least twice, sometimes four or five times to drive as much moisture from the crumb as possible. What was left behind was a hard, barely edible puck, that usually required soaking in beer, coffee, milk, water, broth, or wine to make more palatable. It could be debated that Carter was referring to a sweetened simple biscuit in this recipe. It’s unclear, however. The addition of sugar to the mix would suggest that ship’s biscuit could be used. Another common and apparently popular dish among sailors, depending on the skill of those who prepared it, was lobscouse (a.k.a. Lobscourse, scouse, lap’s course, or lobskous) — a thick and hearty stew of beef or pork, often with root vegetables, that was thickened with crushed ship’s biscuit. Be sure to check out our previous post on how to make lobscouse, and don’t miss the video on lobscouse on our Youtube channel. This entry was posted in 18th Century Cooking, Bread, Historic Cooking, Recipe, Video and tagged biscuit, ship's. Bookmark the permalink. Recently found your blog and am very glad I did. Fascinating! Thank you so much. 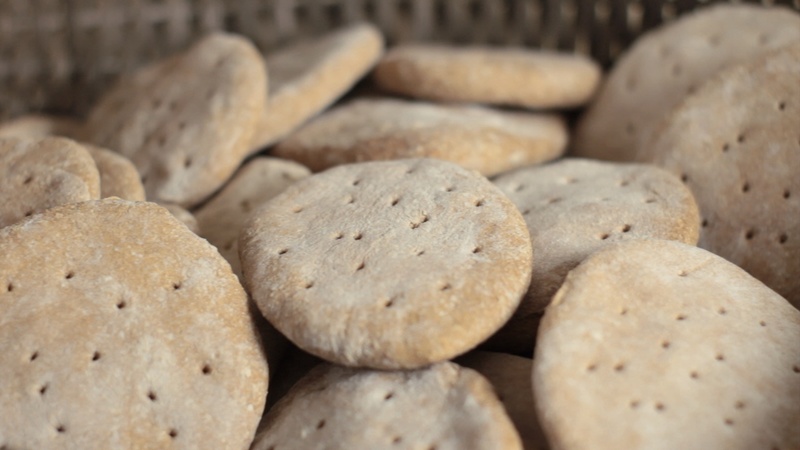 You can still purchase the hardtack made in the traditional fashion from Purity. A very interesting article- thank you! I am from Norway- where we have a traditional stew named ‘lapskaus’ which is pronounced very close to “lobscouse”! (This stew is so beloved and useful (fast and inexpensive dinner) that many varieties exist both tinned and fresh or frozen in the stores. Never forget the 4-5 slices of Norwegian Goat “cheese” aka ‘Geitost’ (it’s a sweet and pungent caramelization of goat milk whey) nor the 5-6 dried juniper berries- both add a certain something to the stew, reindeer or moose meat makes it a dish for royalty! Having portraied Soldiers, both Yank and Reb, in American Civil War Reenactments (we Southern boys like to call that conflict the War of Northern Aggression) there are to be seen dozens and dozens of wooden crates around the camp labled such as “50 Pounds Army Bread – Union Mechinical Baking Co., Boston Mass.” and so on and so fourth. Having gotten the chance to see an actual piece of “Hard Tak” in a Museum, I took some photos of it and made measurements of this piece of Army Bread!